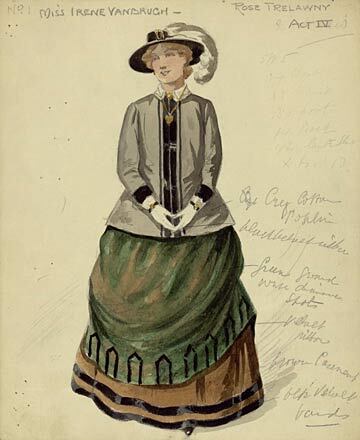 Irene Vanburgh in ‘Trelawny of the “Wells”‘, costume notes. Arthur Wing Pinero’s almost-Edwardian play ‘Trelawny of the “Wells”’ is being revived by the film director Joe Wright at the Donmar Warehouse in London this month. First performed in 1898, it not only spawned an interest in 1860s’ fashions, but two paintings starring actresses Hilda Spong and Irene Vanburgh by leading artists Walter Sickert and William Rothenstein. 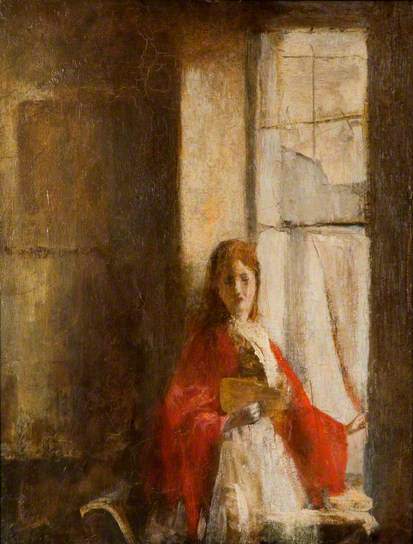 Sickert’s portrait, appropriately enough, was titled ‘The Pork Pie Hat: Hilda Spong in the Trelawny of the “Wells”’. See Wendy Baron, Sickert, Paintings and Drawings (New Haven 2006), p.215 for more information. See more on Hilda Spong here.